As the Amish constantly battle to keep their identity, they rely on their Amish customs to protect them from worldly influence. Amish traditions are dictated by the Ordnung, an unwritten set of rules. The U.S. Constitution is sometimes referred to as a living and breathing document. Well, the Ordnung is truly a living and breathing guideline for Amish customs. Each individual church regularly reviews and if needed, revises their Ordnung to handle changing circumstances. When Amish are faced with advances in technology and lifestyles of the outside world, they must decide how they are to deal with these changes. How will these changes affect the Amish community? Will these changes threaten their Amish way of life? For example, there were no rules prohibiting cars or electricity in 1850 because at that time, those things didn't exist. How can the Amish address the changing world around them? There is no central governing body for the Amish Church. Therefore, each congregation is left to answer these questions of policy on their own. Inevitably, solutions to identical issues vary from church to church. Over a long period of time, differences in Amish customs have developed across the whole spectrum of Amish communities and individual congregations. 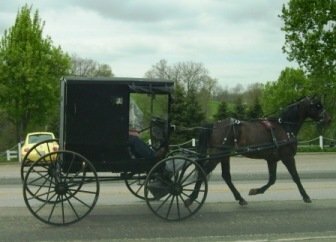 This explains why you see different types of dress, styles of beards, and different appearance of the horse and buggies as you travel throughout Amish country. Although customs may differ from church to church they are still easily recognizable as “Amish customs". Traditions help the Amish preserve their identity and stay separate from the world. The average Amish family has seven children. Birth control is not in the Amish dictionary. They don't practice it and they don't want to, thank you very much. But this alone does not explain the robust growth of the Amish church as a whole. You would think that with all the exposure to the “English” and the outside world, there would be a mass exodus of Amish youth leaving the church. But wait a minute. Over eight out of ten Amish youth choose to join the church and remain Amish for life. We outsiders wonder how this can be. Well, there are many reasons. The custom of speaking only their German dialect, commonly referred to as Pennsylvania Dutch, at home creates a strong identity bond among the Amish people. Children are not taught the English language until they start school. The Amish education begins with the first grade and ends with completion of the eighth grade. The boys then either go into full time farming or apprentice in the trades so that they can work for an Amish shop or business. Upon finishing school Amish girls work at home or sometimes get outside jobs until they marry and start keeping a home of their own. Amish social traditions contribute greatly to the retention rate of more than eighty percent. Barn raisings, weddings, and other frolics where the community comes together, provide a feeling of belonging and security that is often absent in the outside world. After church, on Sunday evening the young people stay for the “Sunday night singing”. This gathering gives the boys and girls a chance to size each other up as candidates for some Amish dating. Choosing an Amish spouse is essential in helping the young Amish decide to join the church. Many years ago I played in a softball league that included several teams made up of Amish teenagers and young men. They were all driving cars and smoking. This struck me odd behavior for a group of conservative Amish men. Between games I asked one of the young players how they decided whether or not to join the church. He told me that in many cases, if the girl you wanted to marry was Amish, you joined the church. Though I hadn't heard of the term at that time, these Amish guys must have been going through a stage called Rumspringa (Pennsylvania Dutch for “running around”). During Rumspringa young Amish men and women get out and experience the world to see what it is all about before they make their decision to join the church. You had better be able to make an informed decision because when you join the Amish church it is for life. If you join and later decide to leave you will be shunned. When you are shunned, you are treated as if you total outsider. The Amish Church forbids any member of the Church to give you any social standing. Amish shunning divides families and causes much heartache in the Amish community. In fact, one of Jakob Ammann's major issues with the Mennonites was their reluctant use of shunning as discipline for those who disobeyed Church doctrine. This along with several other doctrinal differences caused Ammann to split from the Mennonite church. Those who followed Ammann became known as Amish Mennonites. Later the “Mennonite” was dropped and the Amish sect was born. So, how do Amish customs help separate and continue to grow the Amish way of life? Amish Customs like dressing differently, wearing beards, forbidding the use of electricity, and using the horse and buggy instead of automobiles definitely make a bold statement that the Amish people are different and separate from the world. Other Amish customs like frolics, where the people gather together in a common cause of helping fellow Amish in need, build a sense of security and identity that is seldom found in the outside world. The tradition of the Sunday night singing affords the teenage boys and girls an opportunity to pair off with partners for dating. This leads to Amish weddings that add more families to the Amish church. And last but not least, shunning is one of the most effective of Amish customs for keeping young people in the church once they have joined. Imagine for a moment that you are an Amish teenager. The time has come for you to make your life decision. Should you or should you not join the Amish church? You were raised by Amish parents. You were taught right from wrong according to the Christian and Amish faith. You speak two languages which sets you apart from most people of the outside world. In the Amish community you feel secure in the knowledge of whom you are and where you belong. You have been dating and plan to marry an Amish partner. You have gone through Rumspringa and found that the outside world is not all your imagination promised. You've had cable TV and the experience of clicking through one hundred channels and finding nothing worthwhile to watch. You've had a car and possibly a job. You have found that your eighth grade education could condemn you to a lifetime of menial labor. You have been party animal and learned what its like to have a hangover. When the novelty wears off you've discovered that life is not quite as sweet as you expected it to be out in the world. It seems like you don’t fit in. Those Amish customs that you once thought so constricting don't look so bad now. So what's it going to be? Are you going to join the church or not? For over eighty percent of all Amish youths the answer is a resounding...Yes!! Combine this high rate of retention with the threat of shunning and it is clear that Amish customs are truly effective tools for protecting and growing the Amish lifestyle.